Pope Benedict on Wednesday called for increased efforts to stop the spread of AIDS and said victims of the disease should not be treated with disdain. "I am spiritually close to those who suffer from this terrible sickness as well as to their families, particularly if they have lost a loved one. I assure them all of my prayers," he said ahead of this Saturday's World AIDS Day. The Catholic Church opposes the use of condoms and teaches that fidelity within heterosexual marriage, chastity and abstinence are the best way to stop the spread of AIDS. It says promoting condoms fosters immoral and hedonistic behaviour that will only contribute to its spread. It teaches that homosexual acts are immoral. 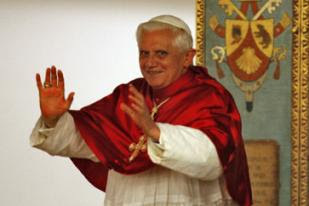 Speaking at his weekly general audience, Pope Benedict called for stepped-up efforts to stop the spread of the HIV virus that causes AIDS, to care for those afflicted and "to combat the disdain with which those who are affected are often treated". According to the latest U.N. figures, more than 33 million people are infected with the AIDS virus. Some 2.1 million people died of AIDS in 2007, including 1.7 million adults and 330,000 children. AIDS activists have often sharply criticised the Church over its position on condoms. In recent years, several top Church officials have called for a change in Vatican policy on condoms to allow their use by married couples where one partner is affected by HIV or AIDS. But the Vatican has been loath to issue any document that could be interpreted as a green light for the use of condoms to stop the spread of AIDS, fearing it would endorse promiscuity.